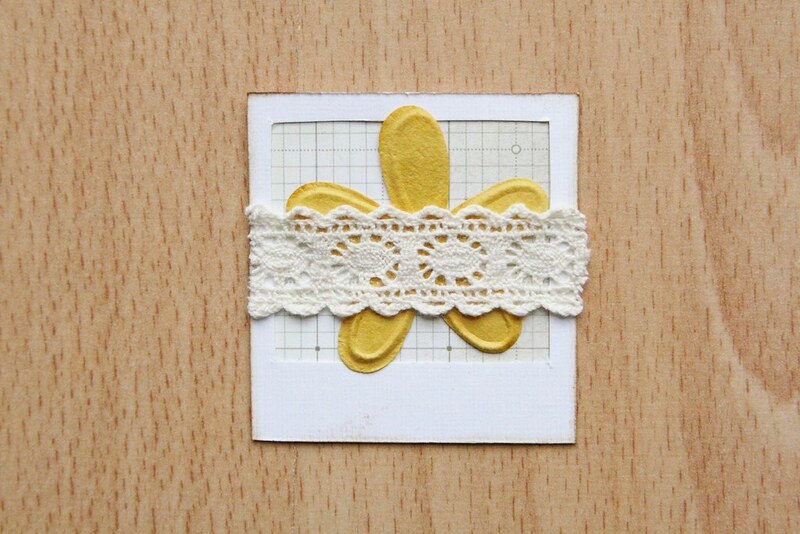 Welcome to the second installment of the Pretty Polaroid Project! 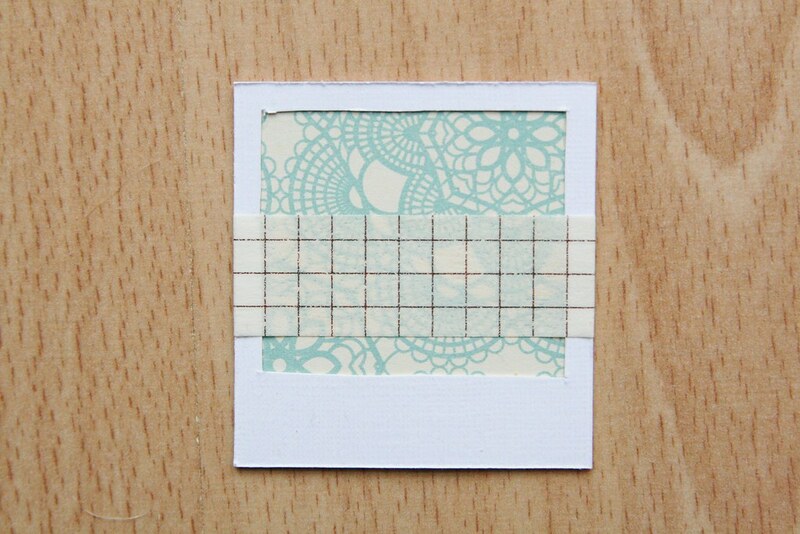 I've put together another step-by-step guide to creating a little embellishment in a Polaroid frame. Do feel free to follow along (and let me know if you make one!) and let's get scrapping! Once again, I know you won't necessarily have exactly the same supplies as me, but be creative and use whatever you have lying around! So this one kicks off in a way that is almost identical to last time. Are you feeling the deja vu? 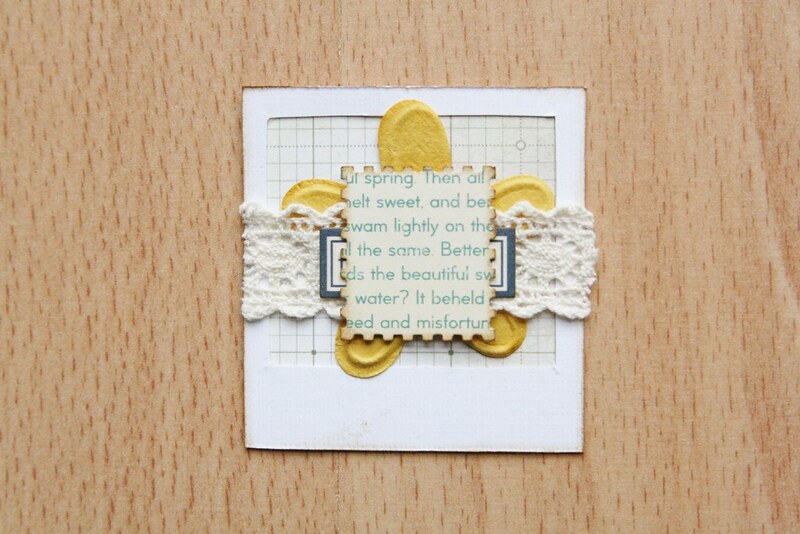 I backed the frame with grid paper, added a paper flower and a strip of lace right across the middle. Why 'the big dipper"? I have no idea. So I'm going to cover up the words. 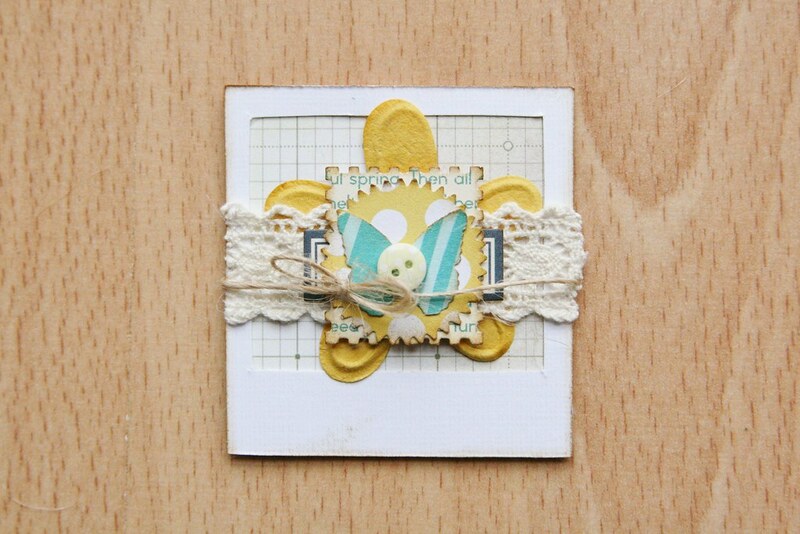 That aside, label stickers make lovely little frames and borders, and are a great way to add layers without adding lots of bulky dimension. ...and finished with a butterfly. Each piece is inked with both links them together and makes them stand out as individual layers. You can see now how the label sticker pokes out from underneath the punches, but you can't see the writing. You'd never even know they were there. Except that I told you. And I showed you. So that would be my bad, but if you could go ahead and ignore them and not tell the rest of the internet my shameful secret, that would be perfectly lovely. Speaking of perfectly lovely, little buttons are great for butterfly centres, but you could equally well use brads, stickers or enamel dots. 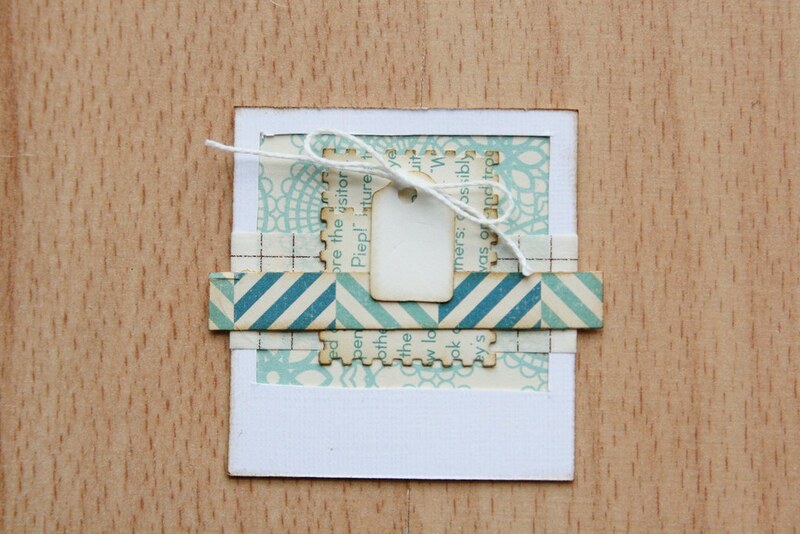 Finally, a little twine bow adds a new texture and finishes off the Polaroid. You can either tie it on properly or do as I did and just tape the ends of the twine to the back. And there we have it: TA-DA!!! You can't see me, but the jazz hands that I'm a-quivering are impressive. Seriously, I could be in Glee. 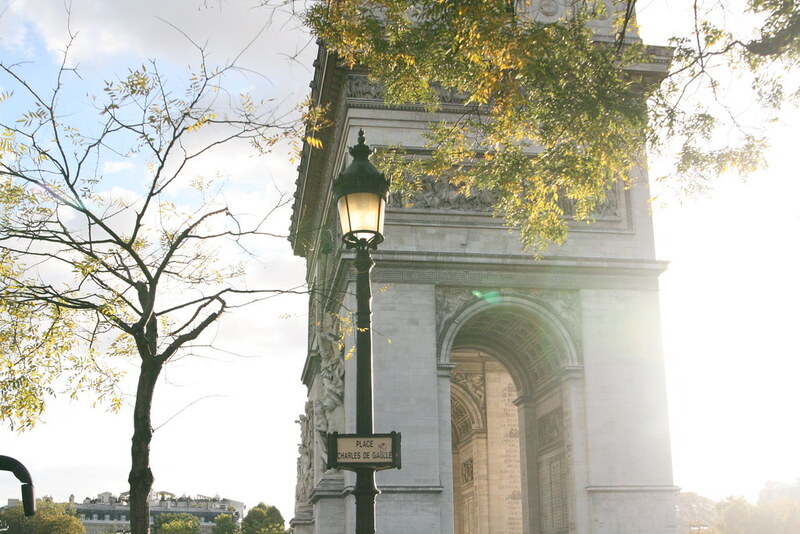 I hope you'll join me next week to see how this photo-themed project develops. And you get extra points if you spotted the oh-so-deliberate-yet-slightly-pathetic pun. P.S. I have recently discovered the joys of the TV programme Miranda. Why have I not watched this before? I LOVE it! Plus if I don't watch it on Monday night, I have nothing to discuss with my Year 12s on Tuesday, so it's basically a contractual obligation. Or it would be if it weren't for the fact that I'm supposed to teach my Year 12s statistics, and not chat telly with them. You may have noticed that there hasn't been much in terms of layouts round here recently. But that’s not because I've stopped scrapping. I know, you were all terrified then for a moment? No? Oh. No, it’s because I’m busy working on pages and ideas for my new class Telling Tales. But I've started to notice that I’m doing a couple of techniques and motifs over and over again. I LOVE camera themed items with a passion and I still can’t get enough of Polaroids. This is a bit odd, as I don’t have a Polaroid camera. Nor have I ever had one. 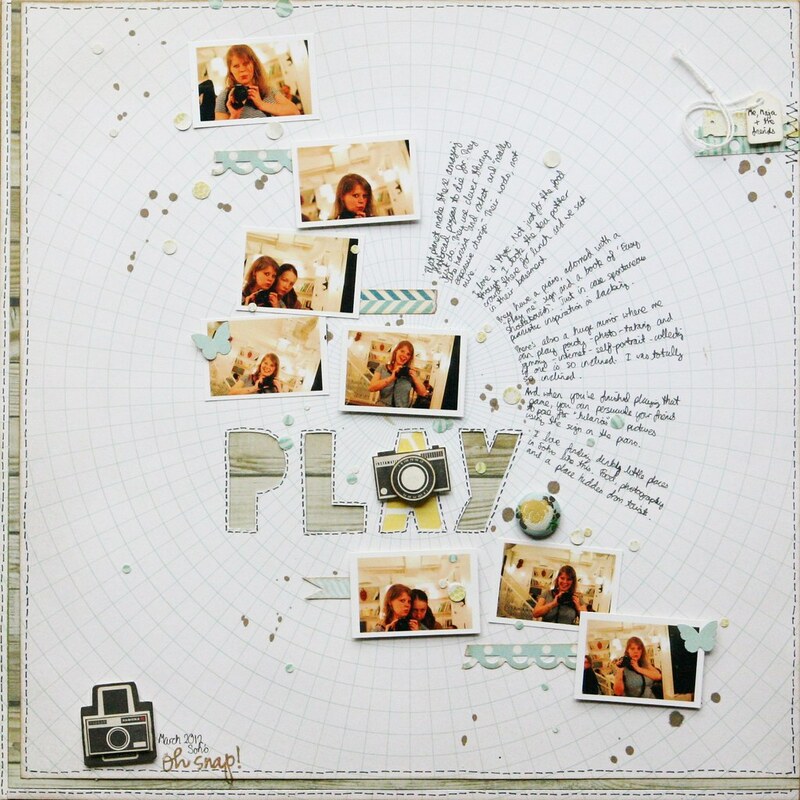 But there’s something about those funny-shaped frames that makes me think craft+photos+vintage all at once. 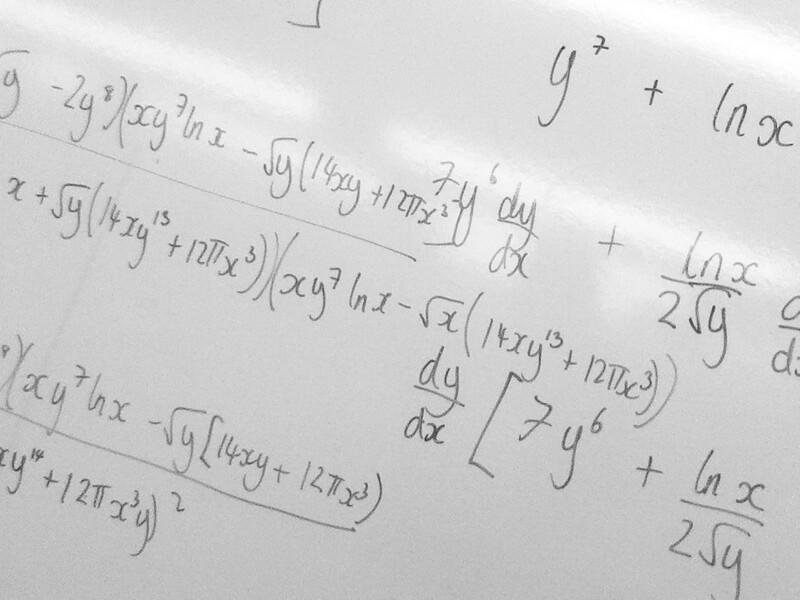 That’s the kind of maths that everyone loves. So while I’m busy working on pages for class, I wanted to share a slightly different project here. 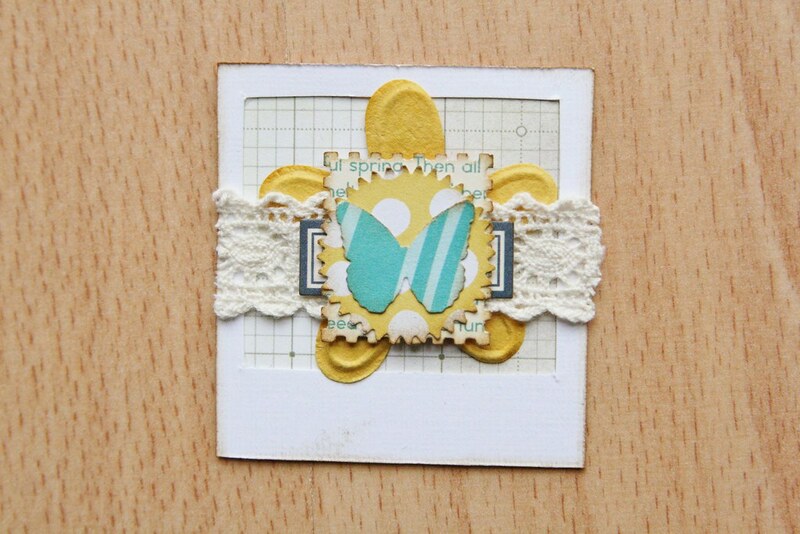 Each week, I’m going to bring you a tutorial featuring little Polaroid frame that has got its craft on. (I’m so down with the kids I’m practically lying on the floor. 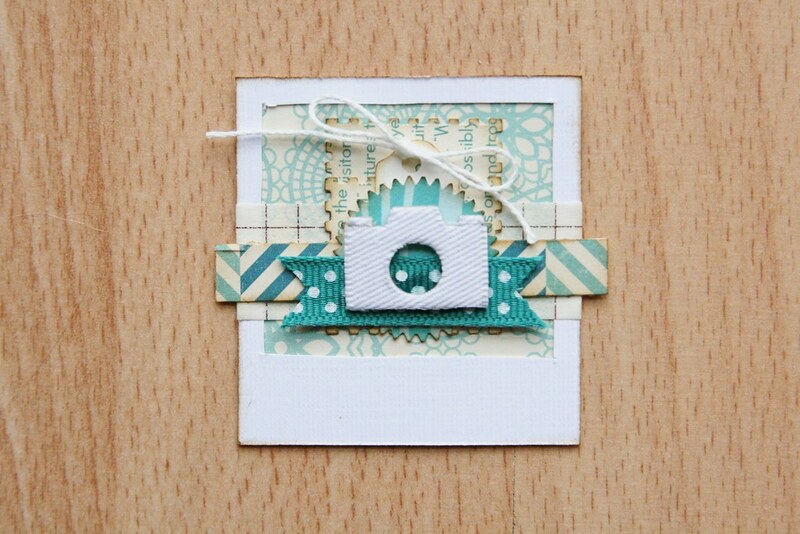 Really) And I don't mean complicated, expensive, product-fueled Polaroids with fancy die-cut bits in trendy colours. Those are cool, don’t get me wrong, but I don’t have any lying about. What I do have is some white cardstock, some patterned paper scraps, the odd embellishment and AMBITION. When you read the word ‘AMBITION’ you have to do it while imagining yourself saying it in a large hall with an echoey effect. And your tone of voice should be hushed and yet ring with importance. Altogether? Are you on board? Sometimes I find it hard to tell when the boat of sanity has tipped so far over that people are starting to slide off the deck. Some people call it crazy, I prefer to think of it as a Miss Smith moment. It’s all good. 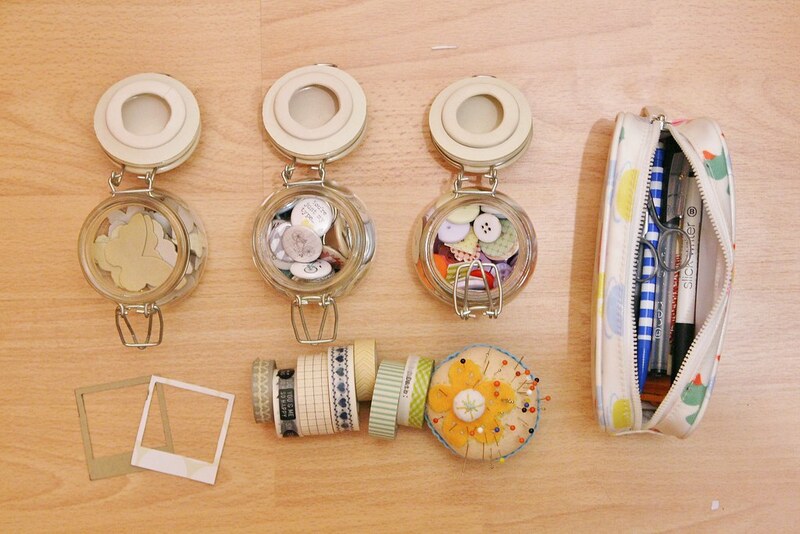 Anyway, I'm going to take my bits and pieces, my buttons and brads, my ribbons and punches, and I'm going to combine them with Polaroid frames to make a series of pretty embellishments. 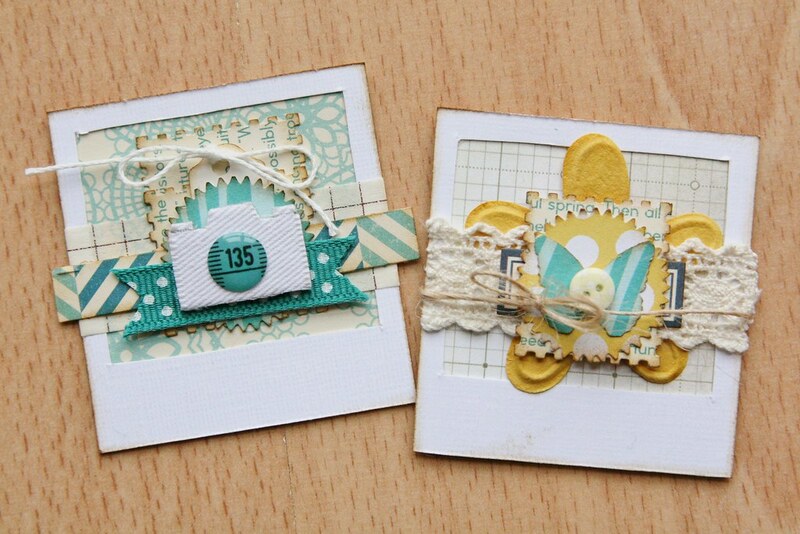 Then I'll share a tutorial here each week for each Polaroid. At the end of the series of tutorials, I'll be sharing a project that will put them all to good use. Anyway, I'm starting by making a few frames from a Polaroid-shaped template I've made. I've cut it out of stiff card and I'm tracing round it onto white cardstock, before hand-cutting the frames to use in future. Perfect TV scrapping. So look out for the first tutorial at the weekend. And while you're welcome to use any frames or supplies or ideas you like, if you do want to follow along with the tutorial, I can send you a copy of the template I'm using for the Polaroid shape. I made it myself. No, no, no, your applause is just to much. You're embarrassing me. P.S. Never fear! Now that my voice is heading back towards it’s usual pitch, I hope to do the next podcast episode this weekend – thank you for your patience! Something I'd like to start doing is sharing tutorials here more. So that's exactly what I've put together for today. Journaling cards are great things to have on hand - to be able to grab one, jot down a few thoughts and attach it to a page can save a lot of hassle. And making your own means they'll be exactly to your taste and style! 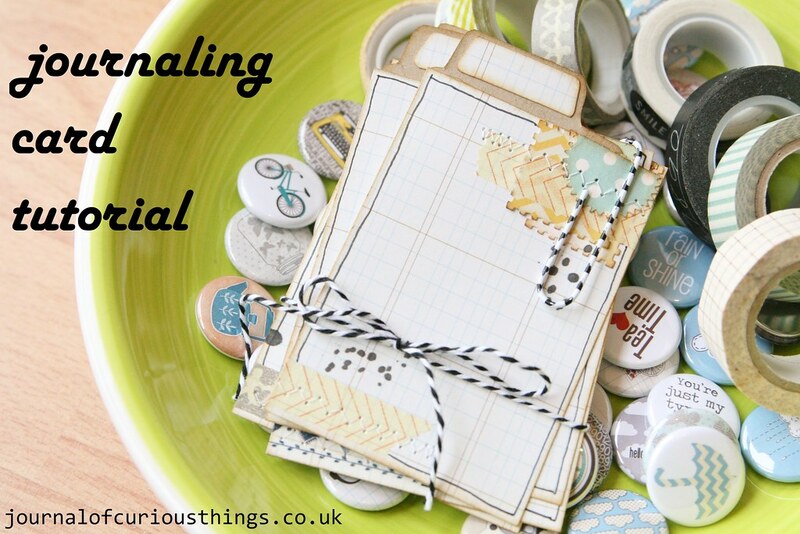 If you enjoy this tutorial and want more ideas for getting stories onto your pages, why not sign up for my new class Telling Tales? You can find full details here (and more info at the bottom of this post). 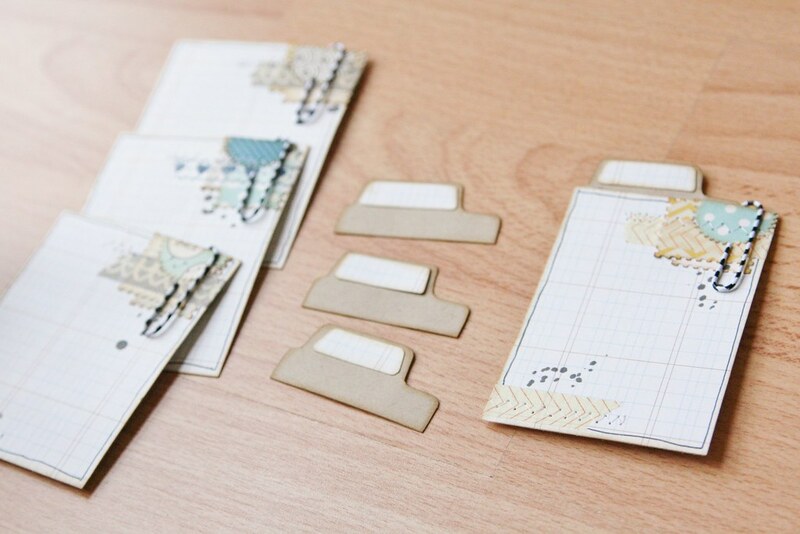 Onto the journaling cards: All you need is some paper that you can write on clearly, a few patterned paper scraps, some washi tape (optional) and some paperclips. 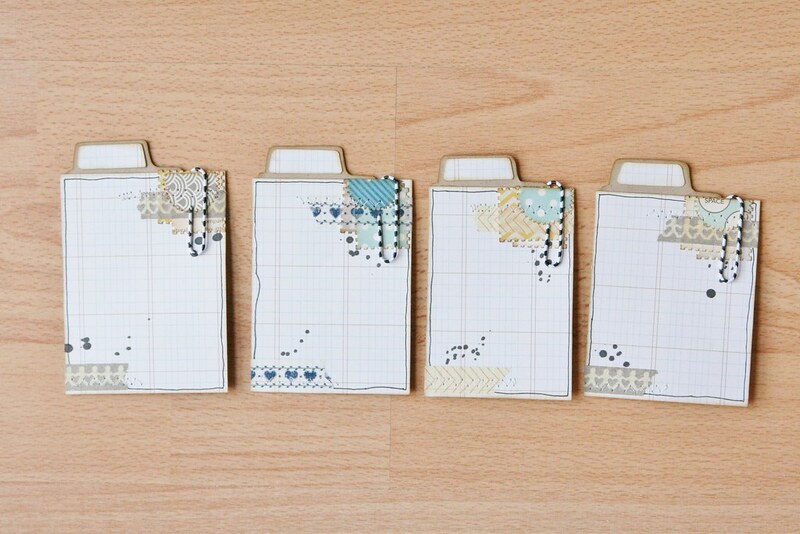 Ledger, grid and lined papers all make good journaling cards as they guide your writing. If you are one of life's gifted writers-in-a-straight-line, I salute you and invite you to forgo the lined paper. I would also steer clear from dark colours as your pen won't show up. I cut out each card at 3 inches by 4 inches and then trimmed some of them down randomly to make them slightly different sizes. I like things to be not quite uniform. The project they're intended for is part of Telling Tales and I know they need to be different sizes, but you may want our set to be the same size. 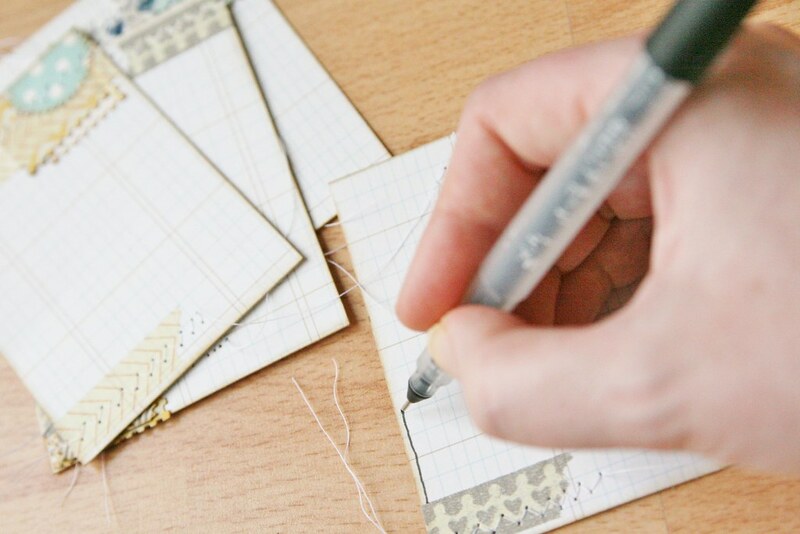 This is a good time to work out how many you want to make, as you can easily follow this process as an assembly line and produce a whole collection of cards pretty quickly. 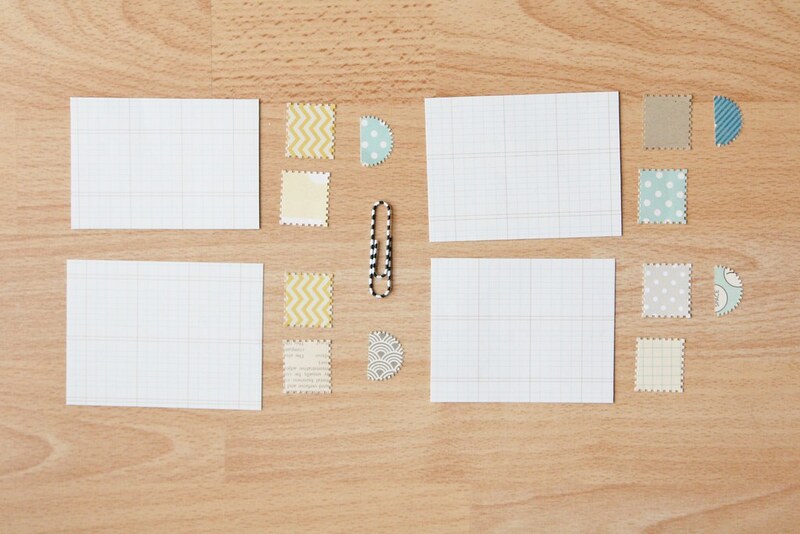 For each card, I punched out 3 shapes from a variety of patterned paper scraps. 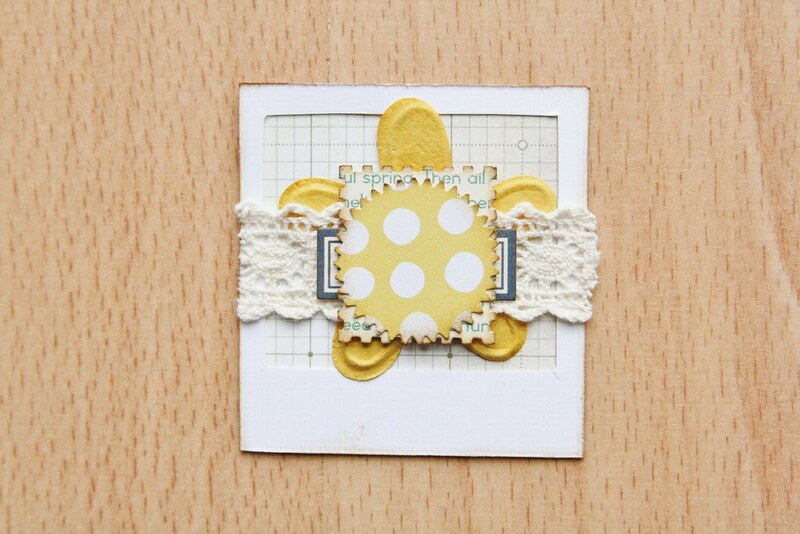 I've done 2 postage-stamp shapes and punched the starburst shape off the edge of sheet to make a half circle. Simply select whatever punches you are loving right now, or get to work with a pair of scissors if you prefer. I stuck to a colour scheme of yellow, blue and grey, but be adventurous as your choose! You might choose to match them to a particular project, make them in your favourite colours, or stick to neutral tones that will go with anything. You can ink the edges of all the pieces to tie them together. Layer up 2 of the punched shapes in the top right hand corner. 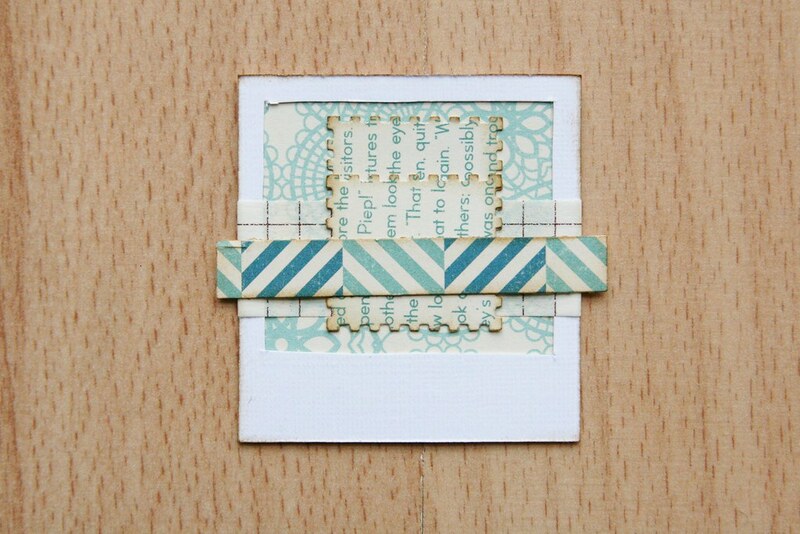 Then add a strip of washi tape to the top and bottom corners as above. 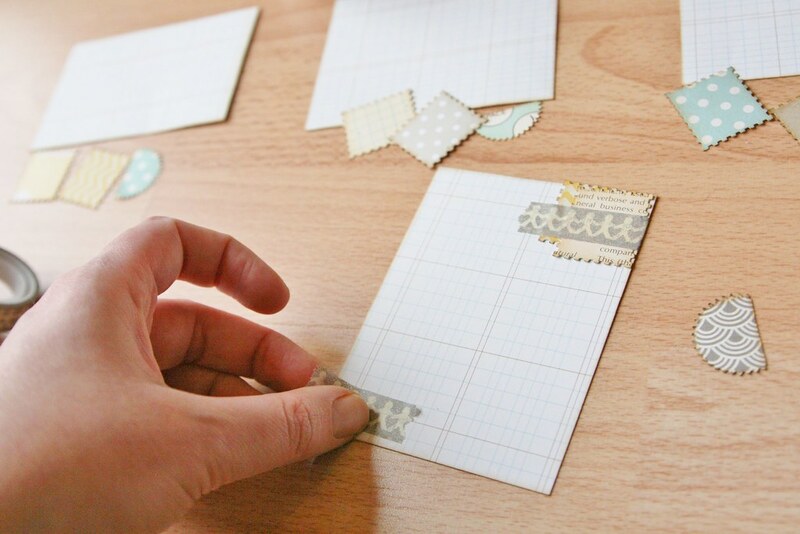 If you don't have an washi tape, you could easily use ribbon or strips of paper. The torn ends add a nice hand-made look, but you could snip them off neatly if you prefer. Finally, top off the little cluster with the final punched shape. 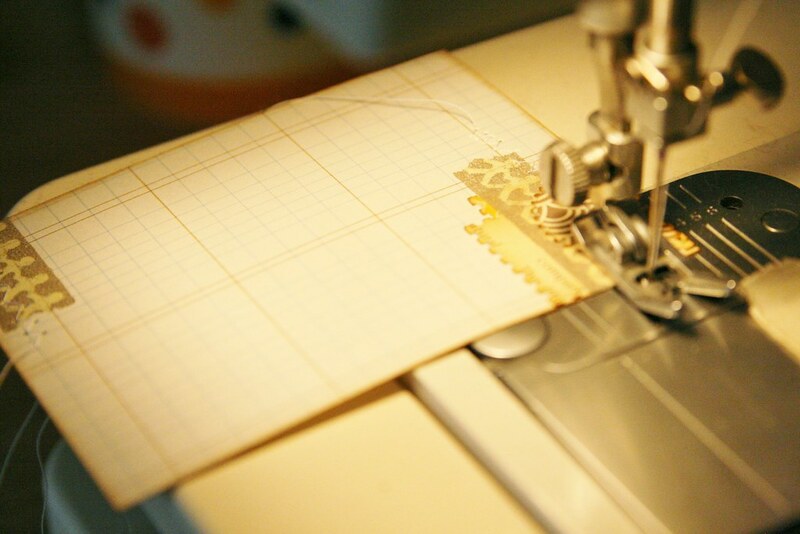 Next, if you want to add a bit of texture and detail, you can sew along the tape at the top and bottom of your card. I went to my machine to do this, and used a zig-zag stitch, but you could do this by hand or simply miss it out if you prefer. 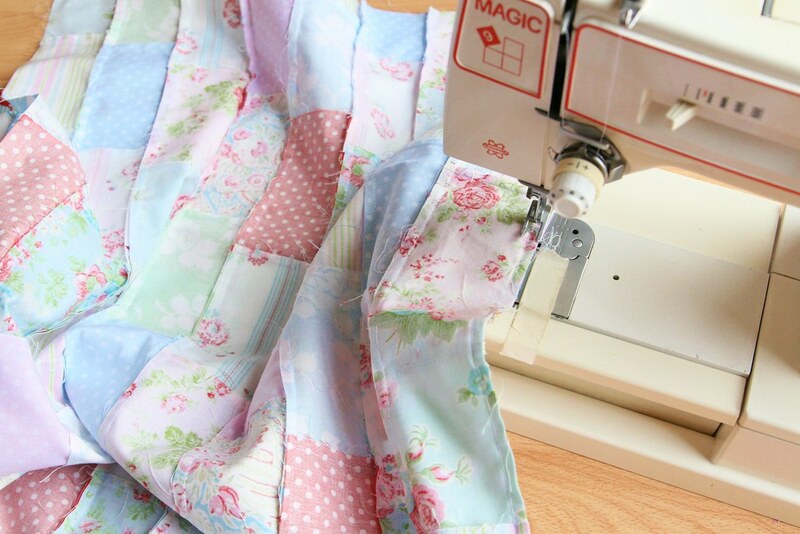 Then pull the ends of the thread through to the back, and secure with thread. 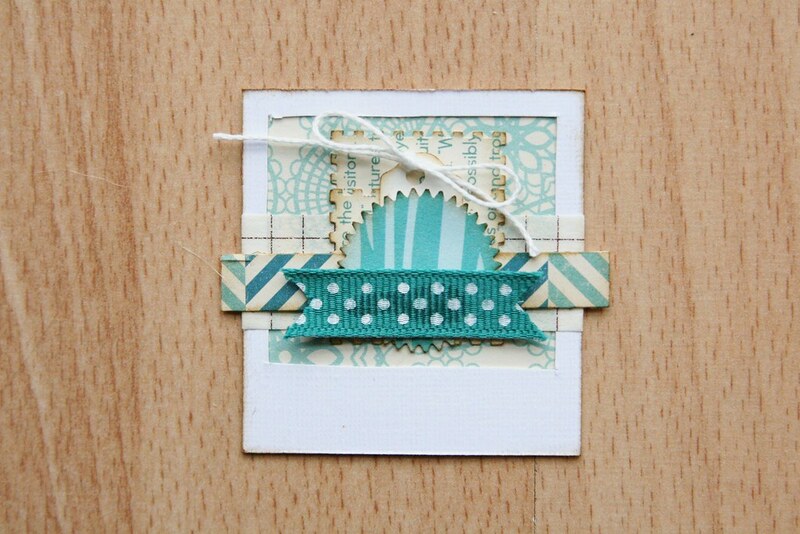 Adding a doodled border around the edge can help to add definition to your cards. 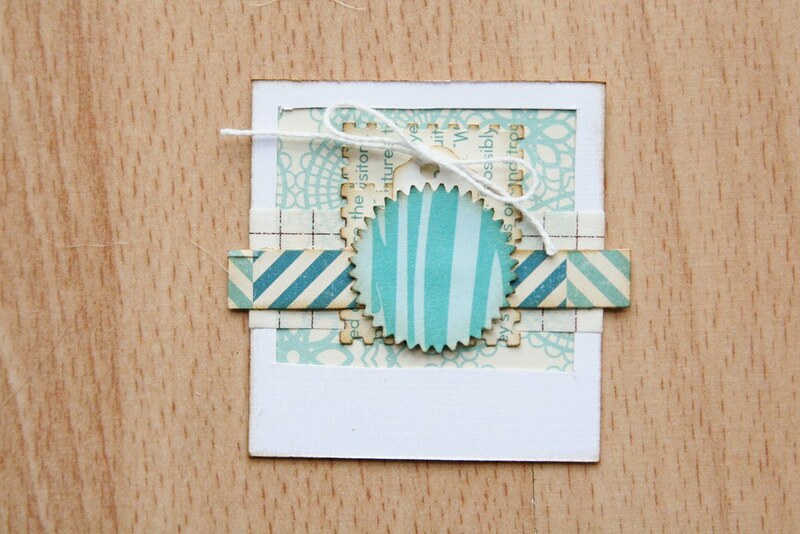 You could do this at the start if you prefer, but bear in mind that it will show through the washi tape. So I waited until this point, and added a couple of dots of black mist as well. 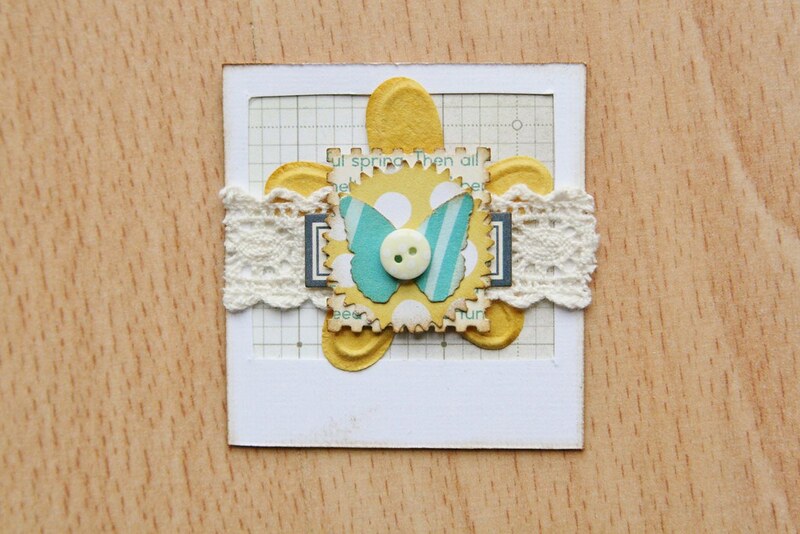 Adding a paperclip onto the top right corner of each card creates a just-clipped-together look which I can't resist. 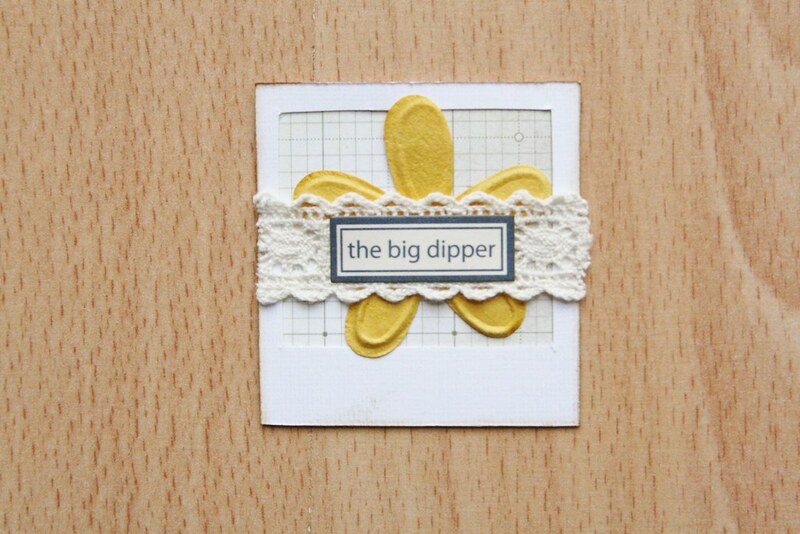 If you're a regular reader of the blog, you'll know I'm a big paperclip fan! 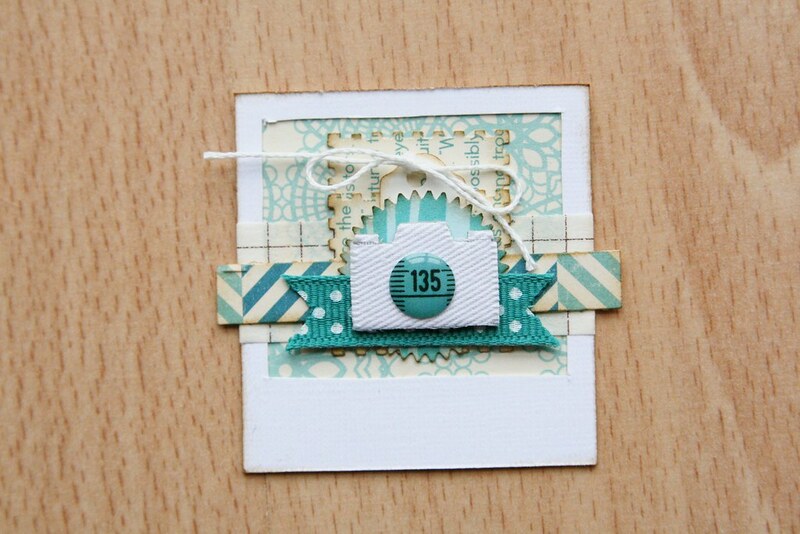 Creating little tabs for each card means you can easily label each one with a date or location or name - plus they make the shape a little more interesting. 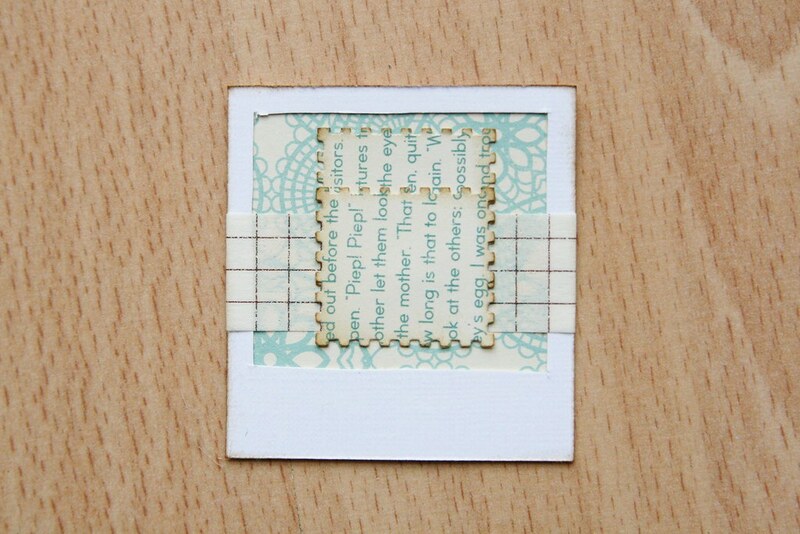 I hand-cut mine and added little labels in the same grid pattern as the background to make them easier to write on. 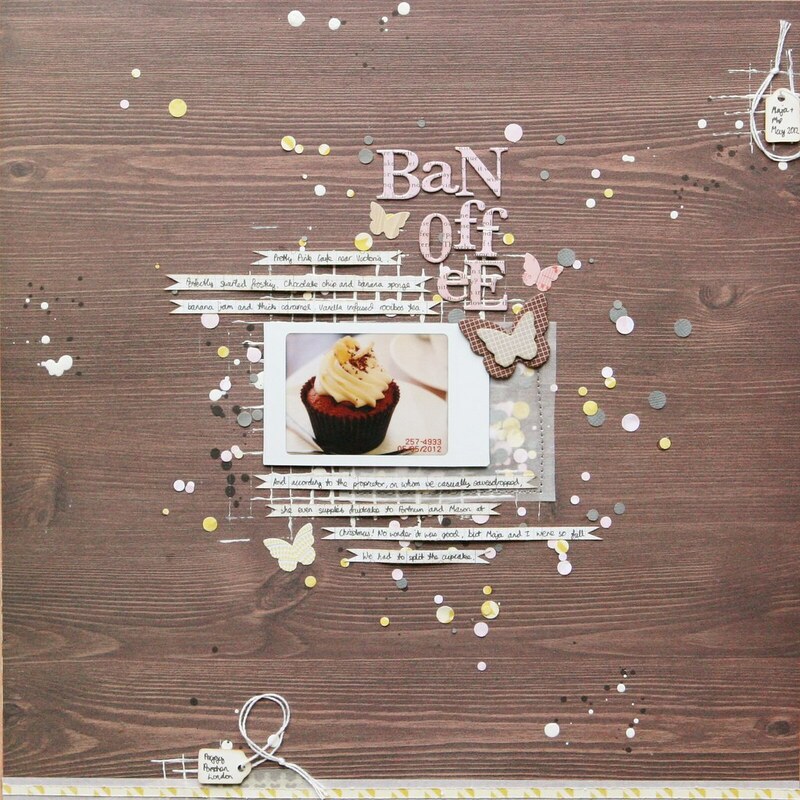 However, a number of scrapbooking companies do produce their own die-cut versions of tabs, and punches are available too (although I've yet to get my mits on one!). Attach them to the back so that the tab pokes up. Or of course, leave them out entirely if you prefer! Hope you enjoyed the tutorial and that 2013 is treating you well. P.S. 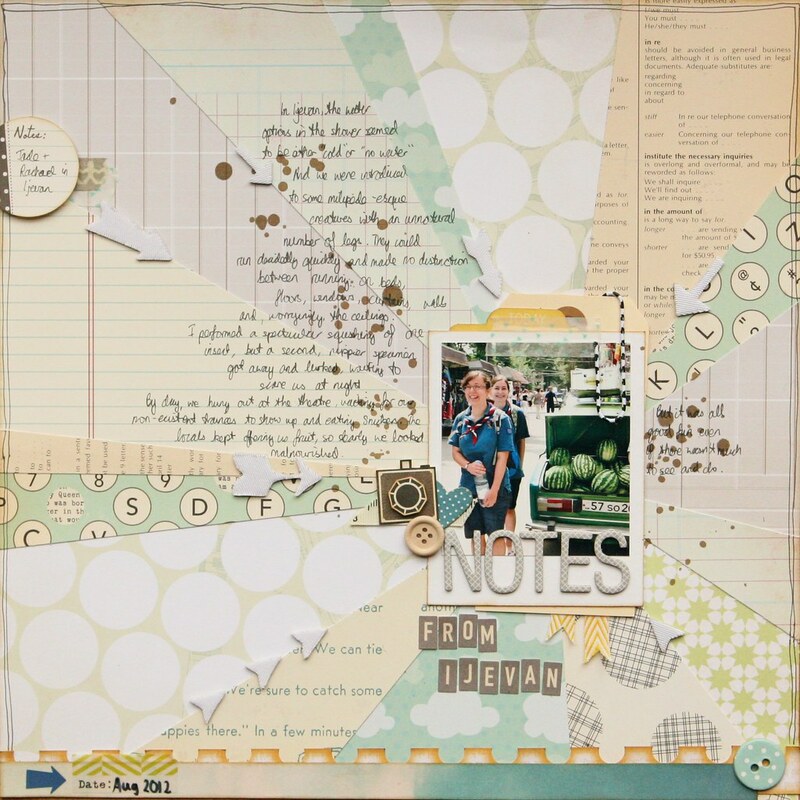 I said I'd come back to my new Scrapbooking Class Telling Tales. We'll be focussing on getting more stories onto our pages through a series of prompts discussing writing, photos, and design. You'll also receive audio recordings, membership to a private forum and lots of exclusive pages with ideas for including your stories in your albums in a variety of imaginative ways. Interested? Sign up here for just £6 and every penny goes to my fundraising for GirlGuiding UK's GOLD project in Cambodia, which you can read about here. P.P.S. My apologies for my absence. Having skillfully avoided illness of every sort during December and the Christmas holidays, and having been just a little bit smug about being of strong stock in the face of all my woefully afflicted friends and relatives, I now have my comeuppance. I am ill, sleeping for around eleven hours a day and snapping waspishly at any student foolish enough to ask a question of me at school. I think my immune system finally decided not to cope any more and just gave up the ghost. P.P.P.S. Stupid pathetic immune system. P.P.P.P.S. On plus side, have spent lots of time with the telly watching Miranda, Smash and Sherlock. AN odd combination, but working for me. Also making garlic pasta in the belief that 6 cloves of garlic in one meal is a) appropriate and b) destructive to illnesses. Should also be pointed out that I love garlic and have a superhuman tolerance. And that I do not inflict myself on anyone after having ingested said pasta. P.P.P.P.P.S. Interspersing the above with new Two Peas/Shimelle/CHA videos. Good times! Got the promotion I desperately wanted at work - hurrah own office and secret tea and chocolate stash! My Guiding Holiday Licence. Next: the international part. Been appointed County Internation Advisor (CIA, darling) for Middlesex East Guiding. Watched all the Harry Potter Films in a Row. Butterbeer please. Had a lovely Tea Potter (No relation to Harry, just an amusing teapot pun) Seems like a long time since the first outing. 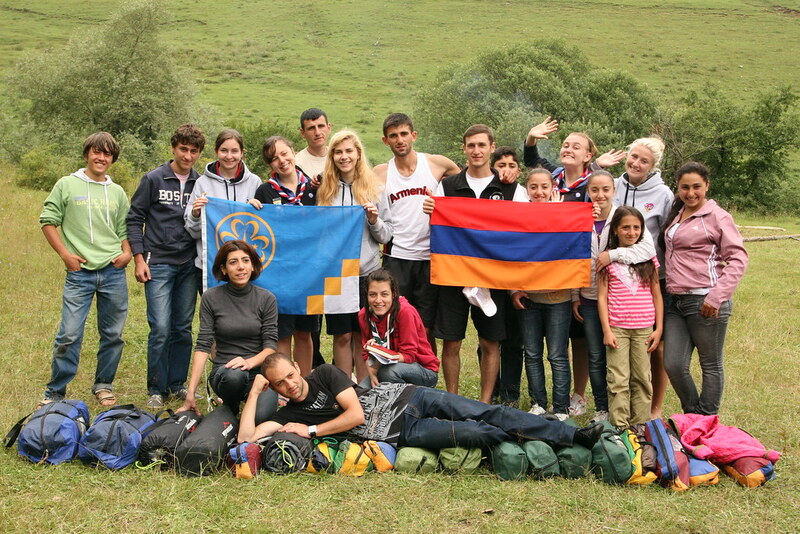 Was selected to be a GOLD leader - Cambodia 2013 watch out! Successfully lead a GOLD project to Cambodia to work with Guiding there and teach English. To say 'yes' more and be prepared to try more things. Finish my patchwork quilt. Please Mum? Spend more time with my family. I miss them. Make a proper layer cake - with COLOUR! Give running another go. Or go faster. I hope it's going to be a good year!